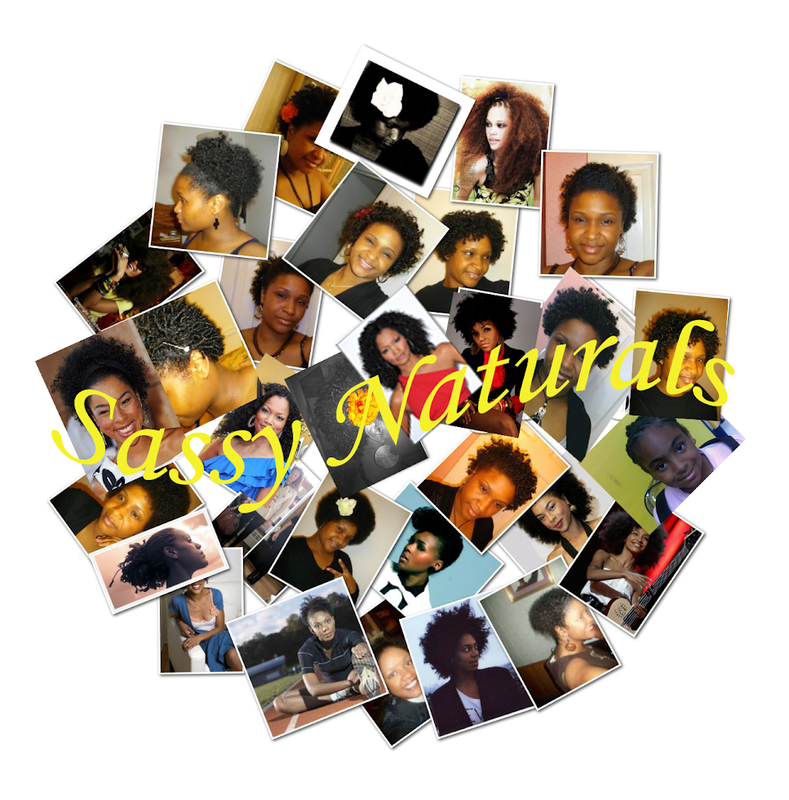 Natural Diva Spotlight - Cia E.
I decided to go natural for various reasons. One was the desire to find myself and not live through my hair. I also big chopped because I couldn’t stand the thought that I had to constantly press out my hair after receiving a relaxer was just killing me!!! I big chopped on June 7 2010 which would make me 9 months natural! I began to transition without realizing it. At first it was just a stretching mechanism but in mid March I decided to really transition. I used to use sew-ins and just plaint ponytails. I also flat ironed which was a bad thing which I learned. Thankfully, I didn't have much heat damage. I try to keep a consistent regimen but I am such a flip flopper. But if I were to pinpoint exactly what I do...its simply I listen. This meaning if my hair feels dirty Ill cowash, if its dry I moisturize and so on. But now I see that my hair is starting to do that regularly as scheduled so most times I co-wash on Fridays and style on Sundays. I try to use my giovanii clarifying shampoo twice a month because it really does strip the impurities. I deep condition every other week or sometimes as needed. I find that best listening to my hair is best but sometimes training your hair is good as well. My holy grail products are as follows: prayer, water/anointing oil, restoration, and release. No just kidding (sorta). I absolutely can not i mean con not live without my Oyin Handmades Juices and Berries, then there is my Shealoe koils by nature leave in conditioner, my Oyin handmade burnt pomade, and Coconut oil! If those were the only thing I were allowed to use then I would be set for life! Trust me guys, I would not suggest transitioning unless you are mental prepared. I feel as if going natural is a lifestyle and not just a trend to follow. You have to make the decision that you want healthier hair (not to say relaxed hair isn’t). The journey may be rough but it is doable trust me! Its an experience of a lifetime! To my newly natural sisters...its a learning process. You will try things that your hair may love and others that it will laugh at. Always remember that your hair are your ROOTS this meaning that your hair is yours so it may not look like the Diva next to you buy embrace it because you were created that way for a reason. Rock your hair in confidence! I love to network so I have a blog, youtube, twitter and facebook! I picked this conditioner from Target for $4.48 on clearance. It says it is for fine or limp hair, but for that price, I could not pass it up! Nectarines fuse pectin polymers (a naturally occurring sugar) to a lank, limp hair to help create weightless hair volume. Dead Sea minerals sourced from the world's most ancient spa, naturally exfoliate, detoxify and rejuvenate. These minerals lock in the vitamins and minerals from the delicious fruits and vegetables. Tomatoes contain Lycopene, a potent antioxidant found in red fruits and vegetables. Its anti-inflammatory properties help clear excess oil from your hair and scalp, leaving hair feeling soft, full, and balanced. I have used this product a few times now and I do believe that this will be a great co-washer. It gives a GREAT slip for detangling. The smell is pleasant. The consisntency is not very thick, but it gets the job done. Would I purchase it again....maybe, but I would like to try the conditioner that is actually for my hair type. I decided to try my mini twists again the other day, and I can tell you that this won't happen that often! I think it took me approximately 5 hours to finish them and I have already taken them down...tis tis. They were cute while they lasted though. I forgot to bring my Komaza Care pudding, so I ended up using nothing but leave in conditioner. The hair accessory was bought at Target on clearance. It adds a little extra and the headband fits comfortably. I ran out of my rosewater and glycerin pre-mixed spray, so I decided to make my own this time. I purchased Frontier vegetable glycerin and Alwadi rosewater. I used a 4 oz. bottle, put 2 parts rosewater, 1 part aloe vera juice, and about 1 tbs. of glycerin. If you plan to try it, you can play around and do variations to find what does well with your coils. Do not use too much glycerin unless you want sticky hair! Be sure to refrigerate afterwards. This spritzer is a great way to add moisture to your hair between washes. 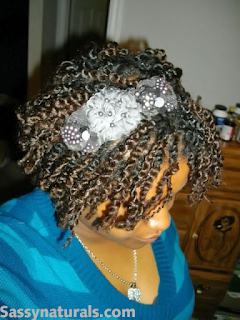 Today I am using it to do dry twists. If you try it, come back and let me know how it worked out for you and your recipe used! Glycerin is great for your hair because it attracts water and water=moisture. Rose water increases bloodflow to the scalp, which promotes hair growth.